“Chop Top Frock” comes from a pattern in Sew Stylish Magazine, by Kathy Cano-Murillo (featured in her new book The Crafty Chica’s Guide to Artful Sewing). The directions were pretty simple. I didn’t cut the arms off, I seam-rippered them off. 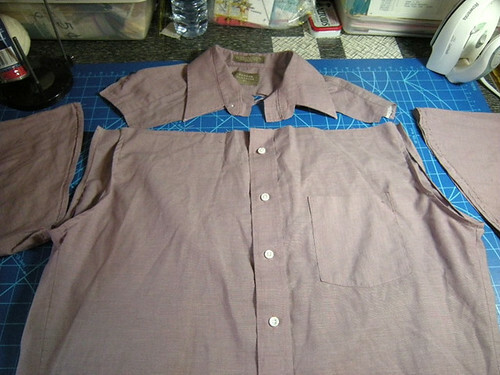 That particular seam was reinforced with interfacing, and I used that as the perfect guideline for finishing the edges of the shirt. Confession: I got going on this project and forgot to take detailed photos of what I did next. Make casting. Turned the front and back edges under, pressed and sewed. I measured around my rib cage and cut elastic according. 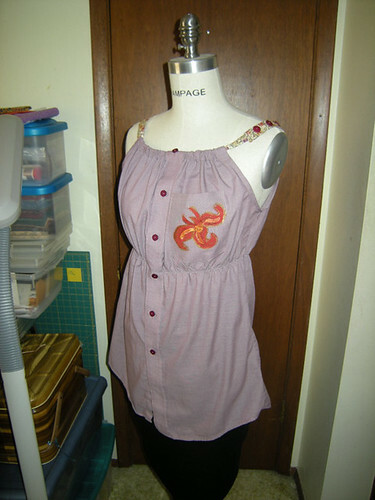 Sew elastic to shirt where you want it to gather. Shirt now gathers. The instructions called for twill tape for the straps. 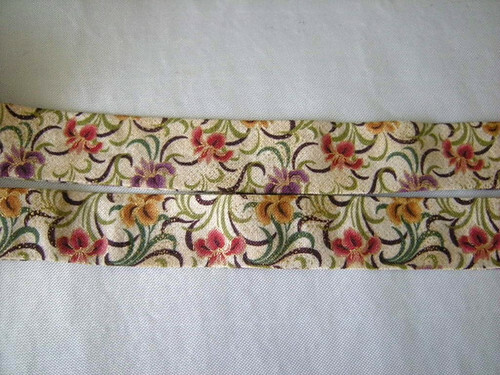 I made my own straps from a piece of flowered fabric that I really love out of Mom’s Fat Quarter Reject Pile. The instructions have the straps tying over the shoulder, I don’t really care for shoulder ties, so instead, I made one long tube and buttoned it together. Paint a flower. 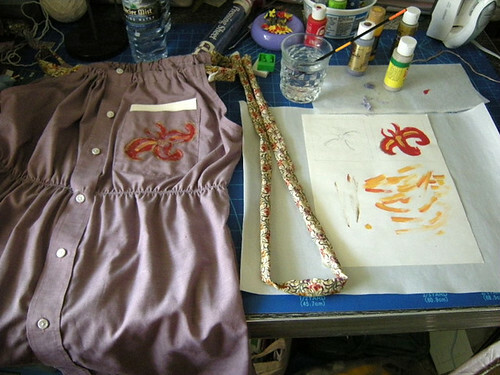 I painted my flower on the pocket, and tried to make it really similar to the flowers on the strap fabric, you can see this in the below photos. The flower has a bit of gold around the edge. Last step: replace the buttons! Pick something that matches well and fits your button hole. I made a practice flower before painting the real deal. I think the practice flower turned out better, but oh well. Strap fabric. Has glint of gold around flower edges, so I used a little gold on the painted flower as well. When it comes to arts and crafts, I love to try new ideas! I’m also an avid recycler. 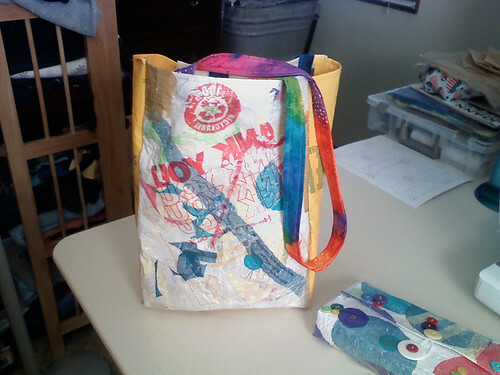 A few weeks ago I came across instructions to fuse plastic bags together and had to try it for myself. 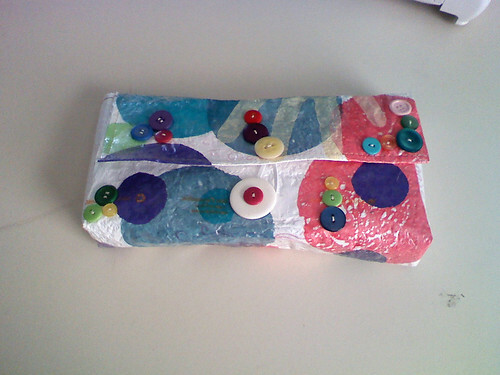 How can I fuse plastic bags together? The tote bag and clutch are just the beginning. I have another one thats about halfway done, and today I bought two zippers to work in my next bag.